Seven in ten respondents reported one at least one supply chain disruption. More 40 percent of these incidents occurred at the tier 1 level. Despite their severity, many such disruptions go unanalyzed, meaning they can easily happen again in the same ways. The main drivers of disruptive supply chain events are diverse. In the past, they’ve included problems with business credit as well as ethical violations. More recently, unplanned IT and telecommunications outages have taken center stage; those two were cited as causes in 60 percent of the responses to BCI’s survey of supply chain disruptions. When information is fragmented across different applications and tools, operational delays become inevitable. For example, a team might end up checking several carrier systems for updates while sharing error-laden spreadsheets via email. Reconciling all of this data saps valuable time. It also complicates tasks such as procurement and supply planning, producing considerable inefficiencies that drive up costs for workflows such as freight invoicing. Ideally, such islands of information can be consolidated without having to resort to onerous manual processes. 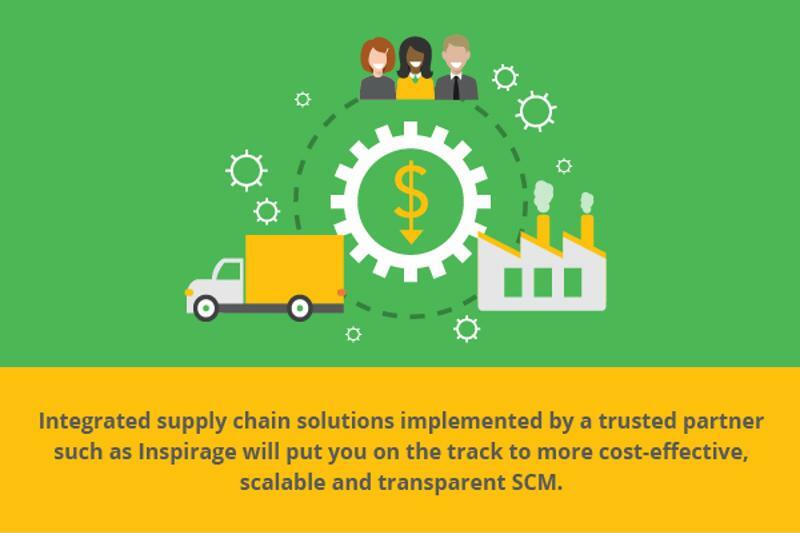 Integrated supply chain solutions implemented by a trusted partner such as Inspirage will put you on the track to a more cost-effective, scalable and transparent supply chain management solution. Outsourcing to third party logistics providers is unavoidable in some industries, not to mention a practical necessity among large organizations with national or even global footprints. At the same time, ineffective third-party partnerships can become a major drag on overall supply chain visibility, with cascading effects across the whole enterprise. Relying on outside help for logistics visibility creates issues similar to those we raised in the first item above: Namely, time-consuming and expensive fragmentation. In contrast, having data points such as carrier commonly available in a platform such as Oracle Transportation Management greatly simplifies transportation management. The results often speak for themselves. A more streamlined supply chain is both economical and easy to manage, thanks to features such as centralized data repositories. Have you ever researched a product on a retailer’s website, checked to verify that it’s available at a specific location, visited that store and discovered instead that the item is out of stock? There are many reasons for such discrepancies, with lack of an up-to-date data near the top of the list. While consumers regularly engage with organizations across multiple devices and platforms, companies do not always possess the right tools to keep pace. Accordingly, they might have to lean on decades-old ERP systems and complex customizations, which together contribute to difficulties in meeting product demand, allocating costs for parts and ensuring that publicly viewable indicators of store stock (e.g., on an e-commerce site or in a mobile app) are accurate. As a result of these flaws and many others, many organizations end up with a supply chain burdened by costs and incapable of adapting to evolving requirements. Overpaying for freight invoices is a prime example of a pitfall opened up by inefficient supply chain management: much of the cost of paying for these items can be eliminated with the right pairing of processes and tools. The good news is that you have worthwhile options for modernizing your approach to supply chain management. Inspirage is an end-to-end Oracle partner with a long track record of ensuring industry-appropriate implementations that finish on time and on budget. Learn more by contacting us today or viewing our Resource Center. To learn more about how supply chains developed and why we face these today, take a moment and watch our History of Supply Chains video. This entry was posted in Logistics Management, Supply Chain Management and tagged Integrated Supply Chain, Supply Chain Management. Bookmark the permalink. Derron Mirtsching is a Solutions Director, Business Development, Logistics Management for Inspirage North America. In addition to that domain focus, Derron is working towards expanding our coverage model in the TOLA region, specifically aligning with the Oracle Oil and Gas team. Throughout his career, Derron has been known as a top performing supply chain solution architect and business development resource with proven abilities in Supply Chain and Oracle VCE.